Note: Some of the out-of-print books below are available at the Ridgefield History Shop —see box above. From the Introduction: "Wicked Ridgefield? What’s with the 'wicked'? Local histories tend to focus not only on the major events in a community’s past, but also on the nicer ones. Any town’s life, however, includes what might be called a wicked side — an assortment of bad guys or bad times that may include thievery, bigotry, murders, missing persons, arson, and other assorted man-made misery. Often these people and events may have been forgotten because they were so long ago — or they may have been tucked away because people preferred to forget them. This book describes aspects of Ridgefield’s past that are sometimes tragic, often sad, and occasionally mysterious. Many accounts provide glimpses into the lives that townspeople lived and trials they faced, while others recall crimes and criminals that upset those lives. In many cases, however, the worst events can bring out the best in a community. People get together, stars emerge, and improvements in how we function as a society result. This look at the darker side of Ridgefield history points out some heroes, offers some lessons, and provides even a little humor. But let’s face it, as anyone from Shakespeare to Agatha Christie could tell you, bad news makes good stories." By Jack Sanders. 160 pages. $21.99. Available at Books on the Common, Ridgefield Historical Society, Keeler Tavern Museum, etc. Published in October 2016 by The History Press. From the Introduction: "Ridgefield’s people, places and things seem to provide a never-ending source of stories, almost all of them interesting and many of them fascinating —such as the woman who became one of Connecticut’s first female physicians, despite having an abusive, drunken father; the man who orchestrated a helicopter evacuation of more than 1,000 Americans from Saigon just before the city fell to the North Vietnamese; or the Pulitzer Prize-winning historian who found Ridgefield, as a place to walk, more beautiful than a Burgundian village. A woman who built one of the town’s most beautiful homes went on to build one of Manhattan’s landmark skyscraper hotels. Her neighbor was an unsung pioneer in the world of vertical take-off aircraft. And from the ridge on which they both lived, a boy who’d later help Nathaniel Hawthorne get published would set out before dawn to hunt Passenger Pigeons a century earlier. These are just a few of the tales of “hidden history” offered in these pages, a sort of sequel to Ridgefield Chronicles... They relate little-known pieces of what make Ridgefield a remarkable place in which to live, work, visit—or write history. By Jack Sanders. 160 pages. Dozens of pictures and maps. $21.99. Available at Books on the Common, Keeler Tavern Museum, Ridgefield Historical Society, etc. Published in 2015 by The History Press. From the Introduction: "Every community is special, with its own history, personality, and local characters, but I like to think that, in many ways, Ridgefield, Connecticut, is especially special. After all, how many towns of its size have had six Pulitzer Prize winners as residents? How many have had a half dozen of its people featured on U.S. postage stamps? And how many have issued medals honoring the nation’s most notorious traitor? Ridgefield has been home to many artists and writers, soldiers and sailors, business and finance titans—as well as a few notable criminals, and plenty of otherwise interesting people...Ridgefield Chronicles is not meant to be a formal history of the community, but rather glimpses into aspects of Ridgefield that will give its residents and visitors a better understanding of this unusual town...I have tried to collect aspects about the town’s history that are not only interesting, but reflect the diversity of Ridgefield’s people and the things they accomplished and the way they lived. The book also examines the town’s varied geography and the names local people have attached to it over the years. Much of this information has not appeared in the town’s three formal histories, or in the dozen or so other books that have been written about aspects of the community’s past." By Jack Sanders. More than 60 pictures. 160 pages. $19.99. Available at Books on the Common, Ridgefield Hardware, Ridgefield Historical Society, etc. Published in 2014 by The History Press. 127 pages of finely reproduced pictures of Ridgefield past, published in 1999. People, houses, businesses, scenes of town life, etc. from 1890s to 1950s. Order from Ridgefield Historical Society, 4 Sunset Lane, Ridgefield CT 06877. $18.99 plus $3.95 postage. More than 215 views of what Ridgefield looked like during the first half of the 20th Century. Postcard images of homes, estates, inns, street scenes, stores, churches, and more. Over 20,000 words of accompanying history and lore about the locales pictured. Bibliography and index. 126 pages. Written by Jack Sanders. First published spring 2003. Available from Books on the Common, Ridgefield Hardware, The Ridgefield Press, and other locations. For more information, click here. Lavishly illustrated, coffee-table book about the town's celebration of its 300th birthday in 2008, produced by Ridgefield Magazine. $50. For more information, click here. Keith Jones wrote this comprehensive account of the Battle of Ridgefield during the Revolutionary War, revealing much new information and correcting many old mistakes. "This telling will remain the standard account of the battle for a long, long time," said Christopher Collier, Connecticut state historian.162 pages, paperback, extensively illustrated. Published 2002. Available at Ridgefield Historical Society. While Keith Marshall Jones calls his book "a two-century history of 23 Ridgefield, Connecticut farmhouses and the people who gave them life," it is really a history of a good part of the town. He has extensively researched a section of Ridgefield that contained a significant cross-section of the community from the 1700s into the 20th Century, and has given us a picture of what life here was like during that period. Published 2001. Hardcover. 509 pages. Many maps, house plans, photos. Indexed. Available at Ridgefield Historical Society. 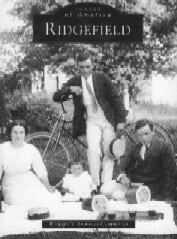 Guided tours of Ridgefield village history, with more than 50 pictures from the past. 56 pages. Indexed. Map. Updated in 2008. $5. Available at Books on the Common, Ridgefield Historical Society, and other locations. Click here for more information. The most modern complete history of the town, published in 1958, with many illustrations, written by Smithsonian Institution historian Silvio A. Bedini. Out of print. Used copies often available at www.abe.com. George L. Rockwell's 583-page classic has been long out of print, but copies become available. Particularly strong on 19th and early 20th Century history, and containing many early birth, marriage and death records. The book has many photos taken by Joseph Hartmann. Cloth and leather editions were printed. Also, in the 1970s, a reprinted edition was published. Used copies often available at www.abe.com. In 1878, the Rev. Daniel Teller of the First Congregational Church published this 251-page history of the town. While almost all of the content is covered in later histories, the engravings of various Ridgefield buildings and scenes, all based on very early photographs, are both wonderful and valuable. Not indexed. Published in cloth and leather versions. Used copies often available at www.abe.com. This is the two-volume autobiography of Samuel G. Goodrich, who wrote more than 100 books, mostly for young people, under the name of Peter Parley. The first 160 or so pages are devoted to his growing up in Ridgefield in the late 1700s and early 1800s and provide a fascinating and rare look at life in the town two centuries ago. Published in 1856. Out of print. Used copies often available at www.abe.com. Glenna M. Welsh's history tells of the early settlement of the town, with particular focus on those who lived on Main Street. Not indexed. Many illustrations. Published in 1976 in paper and cloth covered editions, the clothbound version is still available at the Keeler Tavern or from the Ridgefield Historical Society. Written by Robert S. Haight, Saint Stephen's Church: It's History for 250 Years 1725 to 1975 tells the story of the church and its place in the community. 220 pages, indexed and illustrated. A supplement by Dirk Bollenback, Saint Stephen's Church Reaches the Millennium, 114 pages, indexed and illustrated, covers 1975 to 2000. Sold by the church, 351 Main Street, Ridgefield CT 06877. Email for information. An 88-page, tabloid-newspaper-sized collection of biographies of more than 400 people who made news in Ridgefield during the 20th Century. Also contains extensive timeline. Illustrated, indexed. Published in 2000. Available for $5 ($10 by mail) from The Ridgefield Press, 16 Bailey Avenue, 203-438-6544.